Last November we asked you to sign and share our petition telling California legislators to get oil money out of the state’s politics. Now we’re asking you to join us for a petition delivery and press conference at California’s State Capitol in Sacramento on Thursday, January 25 at 12pm. We know that dangerous oil drilling practices are harmful to our health and may be linked to breast cancer. It’s time to prioritize women’s health by limiting the influence of corporations on lawmakers and getting oil money out of politics. It’s time for our elected officials to put public health before profits. RSVP that you’ll join us for the petition delivery! We’re calling on the Governor and our elected officials to get oil money out of California politics! Activists, community members, health professionals and other experts will gather at the state capital to send a clear message to California lawmakers, demanding they prioritize public health over industry profits. 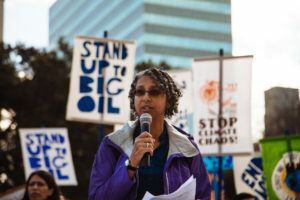 We’ll be delivering our Oil Money Out petition with more than 75,000 signatures to Governor Brown. Accessibility: The press conference will take place on the north steps of the Capitol where we will be spread across the steps, including at ground-level. Participants will stand for roughly 15 minutes during the conference on concrete. ADA parking spaces are available in a parking garage on 10th street and L street less than one block from the capitol building. The nearest light rail station is one block away on 11th street and O street and multiple bus lines stop in front of the capitol building. If you have accessibility needs you’d like to discuss, please email us. In the past ten years the oil industry has spent $266 million on lobbying and campaign contributions to weaken regulations and expand drilling in California, the nation’s 3rd-biggest oil-producing state. Efforts to protect California’s health have been thwarted because of the financial power of oil money, and Californians are fed up with pay-to-play politics. RSVP today! We look forward to seeing you there.